8/ ART GALLERY/ Tomio Koyama Gallery is pleased to present Makiko Kudo's exhibition to commemorate the publication of "Turning", Makiko Kudo's catalogue. 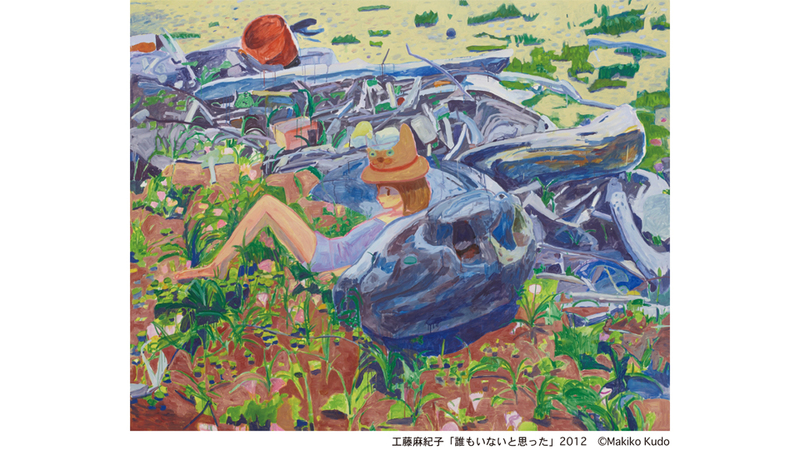 This is the second show of the young Japanese artist series, following Toru Kuwakubo. With her primitive brushwork, she paints the world she has actually seen and experienced such as plants, trees and rivers she sees while walking, a house she used to live in, cats, the moon in the sky, and a dreamy girl, creating somewhat lonely and fleeting fantasy, yet recalling the sweet memories of the past in the paintings. Developing multifarious surfaces simultaneously, bold compositions and free touch of her paintings sometimes display the memories of a childhood sensitivity, giving viewers a fresh impression. At this exhibition, her new works of various sizes are showcased. Please enjoy her world of imagination. "(The art critic,) Terry R. Myers has rightly spoken of "a level of painterly complexity and 'touch' not typically seen in Japanese painting of the last decade" in Kudo's work, but what I want to emphasize is how this complexity of facture represents a twofold sensitivity, both to the surface of the painting as an entity that is not to be thought o as "flat" but on the contrary as dense, richly nuanced, and multivalent, and to the sensations and impulses that play across it. It is in the orchestration of this multiplicity that Kudo's recent paintings attain a kind of classical grandeur." Makiko Kudo was born in 1978 in Aomori Prefecture. She graduated from Joshibi University of Art and Design, Department of Painting, Japan in 2002. Her works have been exhibited at group exhibitions, "Fragile Figures" curated by Tomio Koyama (Pallette Club, Tokyo) and "Tokyo Girls Bravo 2" curated by Takashi Murakami (NADiff, Tokyo). She currently lives and works in Kanagawa prefecture. In recent years, she has shown worldwide, including a group exhibition "Winter Garden: The Exploration of the Micropop Imagination in Contemporary Japanese Art" (curated by Midori Matsui, Hara Museum of Contemporary Art, Tokyo, Japan in 2009, currently touring abroad), and solo exhibitions at Andersen's contemporary (Copenhagen, 2010), Mark Foxx Gallery (Los Angeles, 2011) and Wilkinson Gallery (London, 2012). Her works were exhibited and collected in "Pretty Baby" (Modern Art Museum, Modern Art museum, Fort Worth, TX, USA, 2007) and "MATRIX 213: Some Forgotten Place" (Berkeley Art Museum & Pacific Film Archive, Berkeley, CA, USA, 2004). Her works have been also included in public collections both in Japan and abroad such as The Museum of Contemporary Art, Los Angeles, Olbricht Collection, The Japan Foundation and Takahashi Collection. At the opening of Maiko Kudo's exhibition, 8/ ART GALLERY/ Tomio Koyama Gallery will hold artist talk by Makiko Kudo, Toru Kuwakubo and Tomio Koyama. Toru Kuwakubo, who held a well-received solo exhibition from November 28 till December 17, and Makiko Kudo have been friends ever since cram-school and they were both born in 1978. Those two artists who know each other well will talk about the concepts and thoughts on their works with Tomio Koyama. © SHIBUYA HIKARIE 8/ ALL RIGHTS RESERVED.